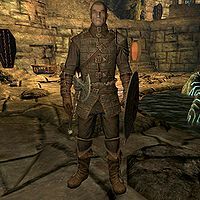 Vanik is a Nord blacksmith and a member of the Dawnguard found in Forebears' Holdout protecting the Moth Priest Dexion Evicus. He is clad in a complete set of Dawnguard equipment. This includes the cuirass, matching pairs of gauntlets and boots, as well as a shield for blocking. He is equipped with a leveled one-handed weapon, and carries random leveled bandit loot, as well as a 25% chance of carrying 1-9 gold. Esta página foi modificada pela última vez à(s) 22h52min de 2 de janeiro de 2014.